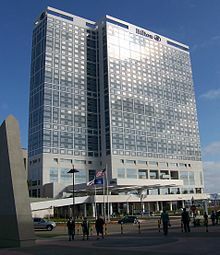 John Calvin Portman Jr. (December 4, 1924 – December 29, 2017) was an American neofuturistic architect and real estate developer widely known for popularizing hotels and office buildings with multi-storied interior atria. Portman also had a particularly large impact on the cityscape of his hometown of Atlanta, with the Peachtree Center complex serving as downtown's business and tourism anchor from the 1970s onward. The Peachtree Center area includes Portman-designed Hyatt, Westin, and Marriott hotels. Portman's plans typically deal with primitives in the forms of symmetrical squares and circles. Portman was born to John C. Portman, Sr. and Edna Rochester Portman. He has five sisters. He graduated from the Georgia Institute of Technology in 1950. His firm completed the Merchandise Mart (now AmericasMart) in downtown Atlanta in 1961. The multi-block Peachtree Center was begun in 1965 and would expand to become the main center of hotel and office space in Downtown Atlanta, taking over from the Five Points area just to the south. Portman would develop a similar multiblock complex at San Francisco's Embarcadero Center (1970s), which unlike its Atlanta counterpart, heavily emphasized pedestrian activity at street level. The Hyatt Regency Atlanta, Portman's first atrium hotel, would lead to many more iconic hotels and multi-use complexes with atria, including the Westin Bonaventure Hotel in Los Angeles (1974–1976), the New York Marriott Marquis (1982–1985), and the Renaissance Center in Detroit (first phase 1973-1977), whose central tower remained the tallest hotel in the Western Hemisphere until the completion of 1717 Broadway in 2013. 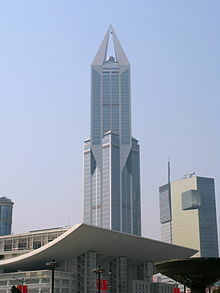 His signature work in China, the Shanghai Centre (1990), was the first of many major projects in China and elsewhere in Asia. 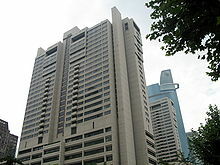 The 5-star hotel inside, The Portman Ritz-Carlton, Shanghai (formerly Portman Shangri-La Hotel), was named after him. In 2009 Portman's work was featured in a major exhibition at Atlanta's High Museum of Art. Portman was a Fellow of the American Institute of Architects. Portman married Joan "Jan" Newton. They have six children, Michael Wayne Portman, John Calvin "Jack" Portman III, Jeffrey Lin Portman, Jae Phillip Portman, Jana Lee Portman Simmons, and Jarel Penn Portman. Portman died on December 29, 2017, aged 93. He was survived by his wife Jan; his children, Michael, Jack, Jeff and his wife Lisa, Jana and her husband Jed, and Jarel and his wife Traylor; his siblings Glenda Portman Dodrill, Anne Portman Davis, Joy Portman Roberts and her husband Phil; nineteen grandchildren, five great-grandchildren, many nieces, nephews, cousins, and other relatives and loved ones. He was preceded by his parents; his siblings Mabel Portman Creel and Phyllis Portman Tippet; his son Jae and Jae's wife Barbara Saroff Green Portman. An asterisk (*) following a listing indicates a work done in partnership with H. Griffith Edwards. 2011 The Atlanta City Council renamed Harris Street in Downtown Atlanta as John Portman Boulevard at Historic Harris Street. Portman was praised for his "cinematic" interiors artfully relating interior space and elements to the individual. In the 1960s and 1970s the placement of such buildings in America's decaying downtowns was considered salvation of the city centers, but some contemporary city planners are critical of such insular environments that "turn their back" on the city streets. For example, the New York Marriott Marquis with its 8-floor high lobby was praised as a "town square", but is now criticized by some for turning its back to Times Square. Nonetheless, at the time the hotel was built, due to the still-seedy character of Times Square, Portman's style of inwardly-oriented spaces made logical sense. Also, he did, in fact, design buildings (like San Francisco's Embarcadero Center) that heavily emphasized pedestrian activity at street level. Portman, John; Barnett, Jonathan (1976). The Architect as Developer. McGraw Hill. ISBN 0-07-050536-5. ^ "Private Enterprise Breathes New Life Into Old Cities". AMA Management Digest. American Management Association. 2: 25–26. 1979. ^ "John Portman, renowned architect and developer, dies at 93". The Atlanta Journal-Constitution. December 30, 2017. ^ McFadden, Robert D. (December 30, 2017). "John Portman, Architect Who Made Skylines Soar, Dies at 93". The New York Times. ^ Pare, Mike (August 7, 2015). "Work on Westin Hotel to Start This Fall in Downtown Chattanooga". Chattanooga Times Free Press. ^ Wachs, Audrey (February 13, 2017). "Emory University to replace a remarkable John Portman building with a new campus center". The Architect's Newspaper. ^ "2009 Lynn S. Beedle Award Winner". Council on Tall Buildings and Urban Habitat. Retrieved 18 May 2012. ^ McWilliams, Jeremiah (November 2, 2011). "Harris Street renamed for John Portman, capping controversy". Atlanta Journal-Constitution. ^ "2013—John Portman". Four Pillar. May 8, 2014. ^ Wooten, Kristi York (March 30, 2015). "How 1980s Atlanta Became the Backdrop for the Future". The Atlantic. ISSN 1072-7825. ^ Craig, Robert M. "John Portman". New Georgia Encyclopedia. Retrieved January 7, 2018. ^ Traub, James (2004). The Devil's Playground: A Century Of Pleasure And Profit In Times Square. Random House. p. 153. ISBN 978-0375759789. Buildings by John Portman Jr..
Johnportmanfilm.com: 'John Portman: A Life of Building' — film about Portman's life and works, aired on PBS stations in June 2013. This page was last edited on 24 January 2019, at 07:26 (UTC).